There are often many early warning signs that people tend to overlook and ignore when they are married. They might make excuses for certain behaviours their spouse commits and not realize there is a much bigger problem brewing beneath the surface. Part of being in a committed relationship is learning how to recognize when your spouse is having difficulties they might be having problems sharing with you. Sometimes in order to get them to open up, it requires asking probing questions in a caring and calm manner. If you come across like you are accusing them of something, they will only withdraw further, typically feel like you are attacking them, and respond by becoming defensive. The best way to approach subjects is to find a quiet and comfortable location where you can be alone. For couples with children, it can be challenging to find time alone where you can speak. One recommendation is to ask a friend or relative to watch your children so you and your spouse can be alone for several hours. Sometimes discussing things at home can make the other person feel trapped and reluctant to talk. It might be worthwhile to consider speaking with your spouse in a quiet public area, like a park. In this example, you are sharing how you feel in the situation and it helps open communications with your spouse. Hopefully, they will give you a response and let you know what is wrong, like changes at work or something you did that upset them but they were afraid to bring up and discuss. In the event they say everything is fine and to not worry about it, does not mean you should do so. 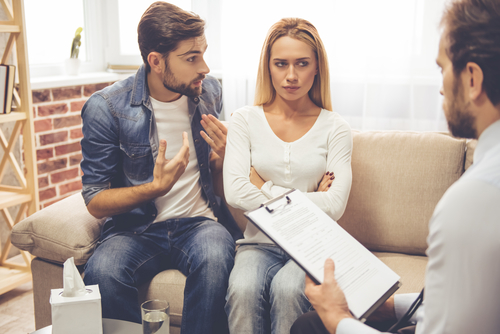 Ignoring the situation and hoping it will improve could only lead to further concerns, intimacy issues, and other problems that will put additional strain on your marriage and relationship. From there, we can discuss developing effective communication techniques to assist you in attempting to get your spouse to open up. In addition, I can meet with you and your spouse as a couple, or in one-on-one sessions to fully assess the situation. To schedule a consultation appointment, please feel free to contact my office at 416-488-3102.